My friend Jessica’s new book is here, and I’m so excited for her! The Pretty Dish is bursting with 150 colorful, flavor-packed recipes in Jessica’s true How Sweet Eats style, and all of them can be made in under 60 minutes. Well, slow cooker recipes excluded. Plus, she included 50 beauty DIY recipes. Homemade bath melts? I’m into that. Jessica is as bubbly, witty and adorably self-deprecating in person as she is in writing. Her enthusiasm is infectious, and the book’s cover is the most perfect representation of her colorful personality and the vibrant recipes inside. 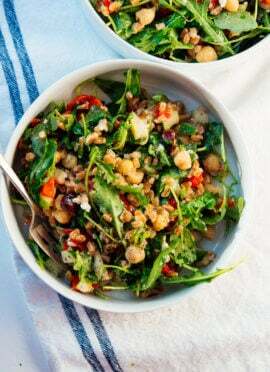 I was drawn to this chickpea recipe because it’s so simple and reminds me of some of my favorite deli salads. These marinated chickpeas with feta and basil are spicy and garlicky. They’re a little sweet, too, thanks to the roasted red peppers and a touch of honey. They strike an irresistible balance between the two, and I could not stop going back for more. If spicy and garlicky aren’t your thing, you can decrease the amount of red pepper flakes and garlic. As a spice-lover, though, I think she has struck the perfect balance. Don’t plan on eating this salad before a hot date, garlic breath! Jessica says that this recipe is delicious the minute you mix it all together (it’s true; I was tempted to eat it all right then). However, if you let the mixture chill for at least 30 minutes, the flavors mingle and you end up with an even tastier dish. The only change I made to Jessica’s recipe is that I went ahead and doubled it, because you’re definitely going to want more of it. The amounts offered below yield the amount you see in the photos here. 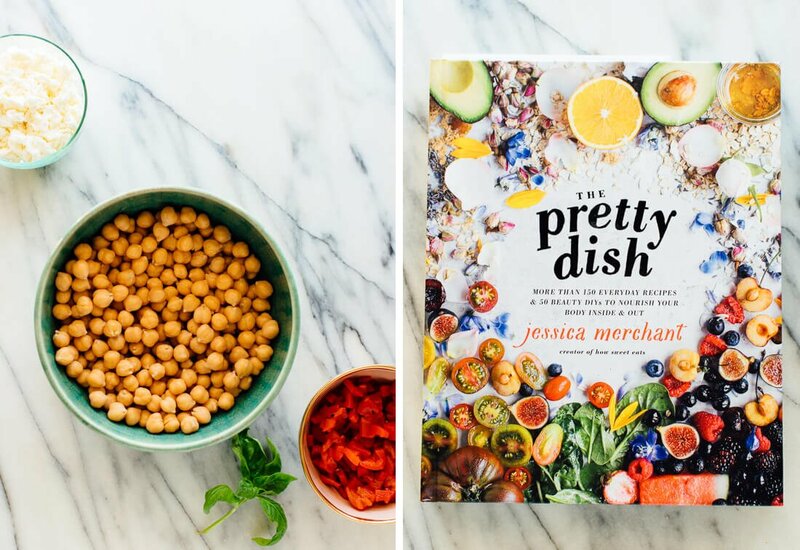 Be sure to check out a copy of Jessica’s new book, The Pretty Dish! And please let us know in the comments how you like these chickpeas. These marinated chickpeas are a little spicy, a little sweet, and totally irresistible. This recipe as great on its own as a light meal or appetizer, or served on salads or inside pitas. Recipe yields about 6 side servings. 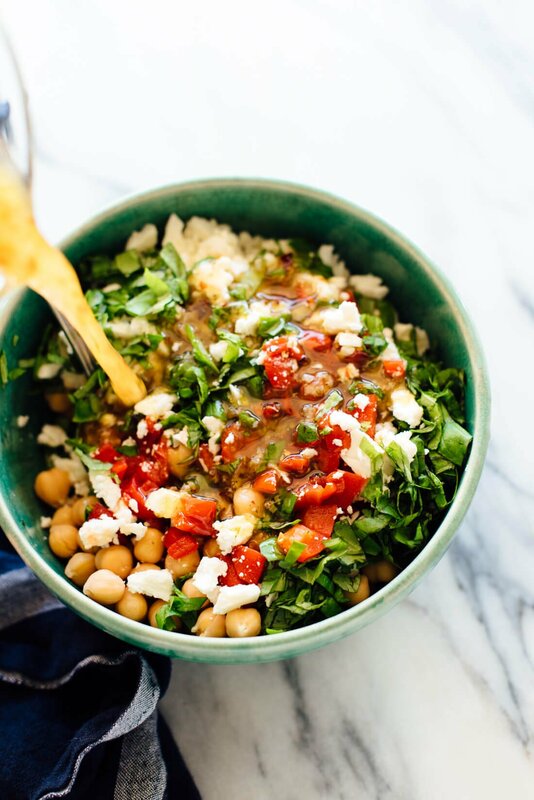 In a medium serving bowl, combine the chickpeas, red peppers, feta and basil. 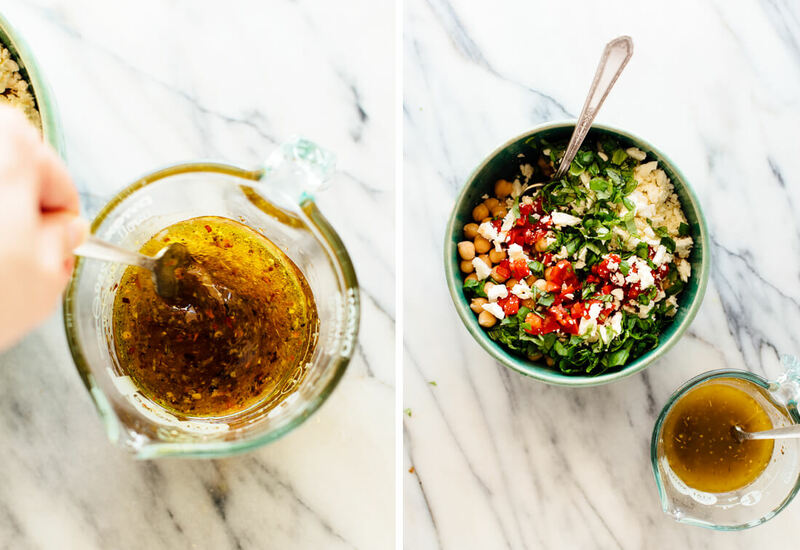 In a small bowl, whisk together the olive oil, vinegar, honey, garlic, oregano, salt, pepper and red pepper flakes. Pour the dressing over the chickpeas and stir. Cover the bowl and stick it in the fridge for at least 30 minutes, for best flavor. The salad keeps for up to 5 days in the refrigerator. Recipe from The Pretty Dish by Jessica Merchant. I doubled it. Make it dairy free: I think you could replace the feta with sliced Kalamata olives and/or sliced pepperoncini peppers, to taste. They won’t make up for the creaminess of the feta, though. Change it up: Jessica suggests that you can substitute cannellini or great Northern beans for the chickpeas. Hey Kate! I know you did a list of cookbooks you recommend / regularly reach for a few years ago, but I’d love to see an updated list! This is fantastic. I’m trying a (non) diet, Mark Bittman’s rule of eating vegan before 6pm. OK so feta isn’t vegan, neither am I. I only did two things differently- I added a few canned hot cherry peppers BC I was short a few ounces of sweet and cut back the pepper flakes to a 1/2 tsp. I also pressed the garlic with the flat side of a chef knife with the salt. Still very spicy (in a good way). If you are at all cautious with hot and spicy you may want to omit the peppers entirely and add some later if you choose. Thanks for sharing your variation, Jeremy! I appreciate the review. This looks perfect! I’m 38 weeks pregnant and my freezer is stocked with soups/veggie lasagnas, etc., but I’ve wanted a few more fresh and fast bean salads for the fridge. (Your Leabanese salad is already in there!) and this looks perfect. Love your recipes! Ooooh, I’m a HUGE fan of this spicy and sweet flavor combo! Looks like such a nice recipe! I love how clean, refreshing, and simple the entire recipe is. I’d have to make it dairy free and just omit the feta cheese–maybe replace it with avocado–and substitute the honey for maple syrup! I made this for dinner last night as I was craving something quick and healthy. Yum! It totally hit the spot. Enjoying the leftovers (even better!) for lunch right now. Glad this salad hit the spot, Kathleen! I appreciate the star review. Since morning I was thinking what recipe should I go for, so I was searching it on google and found your’s Marinated Chickpea. It looks delicious gonna prepare it for evening. I frequently make dishes with chickpeas but this on is extraordinary. I would have never imagined about this marinated chickpeas. Thanks for sharing such an exquisite recipe with us. She will appreciate the kind words! You’re welcome. I made this dish yesterday and it was fabulous. I added some black olives and cherry tomatoes and served it with some roasted sweet potatoes. the combination is great. Omg! These are so delicious and so easy to prepare! Thanks for doubting the recipe. Yum! This is fabulous, to say the least. I can’t eat dairy so I used kalamata olives and they work really well, so thank you for that suggestion! All the flavors work so well together. My mom has asked that I make it again for Easter brunch next weekend. Thanks for sharing, Kate! You’re welcome! I’m happy to share things that I think are just delicious. 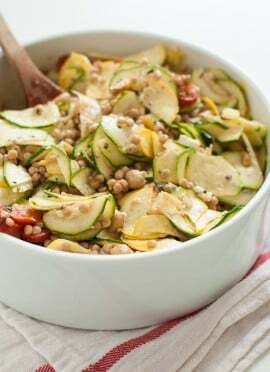 This salad sounds so simple to make and is just what I need today for tea time! I will grab the ingredients and make it right away. I just hope it looks and tastes as good as yours! I bet it will, Kelly! Let me know what you think. 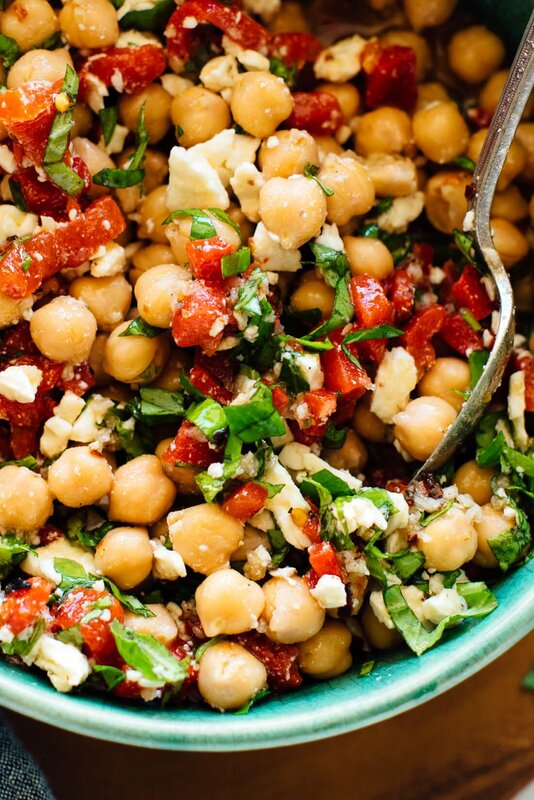 Oh my…I’ve always loved your chickpea salad recipe, but this one is now my new favorite. Sorry Kate =( The red pepper flakes give it a punch. I guess that is ok… :) Kidding! I’m happy to hear it. This is really good! I made this a few days ago and I’ll definitely be making it again. I am a mum of three so I really don’t have too much time to dedicate to meals but I am on a mission to lose the baby weight. This recipe has enough of the dressing in it that you can toss it over mixed greens without using additional dressing. I also added some grilled chicken to mine too and it all went together great. I roasted my own bell peppers and I think next time I will just add raw chopped peppers instead because I didn’t care too much for the slimy texture. I also used four large garlic cloves instead of medium ones and the garlic flavour was way too strong so I will scale back on that too. I just found your blog and it looks like I’ll keep coming back for more! My husband and I have been tossing the idea of becoming vegetarian for some good eating. I have a freezer full of near so we’ll splurge on meat once a week until it’s gone.Yourrecipes sound and look awesome. I don’t think we’ll even miss the meat as we progress. Thanks so much for the recipes and the photos. I like to see what things look like so I’ll know if I’m on the right track. Welcome to the blog, Vicki! You’re welcome. Let me know what you think as you try recipes! This was so good! I like to top my daily veggie salad with something like homemade 4 bean salad – I am using this instead and loving it! Thanks for sharing the recipe…..
Love this recipe! 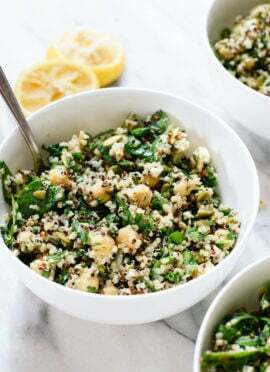 Served it over chopped spinach and quinoa for lunch — a great “transition” recipe from Winter to Spring. Sounds like a great way to serve it, Tara! Twice! She will love that. Thank you, Audrey. What should we serve it with? Devoured before this could be thought out properly. You could pair with a simple salad! Thank you for your star review. This is my favorite recipe, I love chickpeas and have told some of my friends about your recipes and use this as a top example of the taste, ingredients and simplicity. I brought this to a potluck and to make it go further I added red rice to the recipe and it was perfect. Let me know what you think, Jayden! Thank you, Jamie for the review. I’d have to say this is one of the best chickpea salads I’ve ever made! Sweet, spicy and delicious. So flavourful. Jessica will love that! Thank you, Carley for commenting. I made this recipe a few weeks ago and it was just awesome. Today I made it again and didn’t have a red pepper to roast, so cut some cauliflower up into small florets, then roasted them…. Not bad as an alternative!! Thank you for sharing, Donna! This was amazing! Loved the dressing. Added some chopped raw red peppers for crunch. As someone else wrote, I hardly had time to marinate it more than 20 mins and no room in fridge, but it still tasted great with crusty fresh bread and some carrot and celery sticks for a quick, easy and tasty supper. Thanks a lot! Will definitely use it as a pot-luck contribution soon. Wonderful! Thanks for the review, Wendy. Excellent salad!!! It is a keeper! Thank you! I’m happy you think so, Aneta. I can’t wait to try this. Perfect to take to a summer barbecue so I can stay on my WW diet. Sounds delicious! Thank you! Oh. My. This is soooo delicious! Must check out the rest of your site and see what other yummy recipes you have. Thank you! Yes, please check out the rest of the blog. A lot of great recipes! I love to hear from you, so thank you for your review and comment. This was AMAZING! definitely going on my biweekly meal rotation. I came across this recipe through a google search and felt a compulsive need to try it, just from looking at the ingredients and lovely pictures. I must say I am very pleased. It turned out to be delicious and quite filling. Thank you! My modification: I cut back on the garlic cos I’m not a fan and I added a dash of lemon juice to balance out the sweetness. Thank you for sharing. I definitely can have this everyday. It is so good! Perfect combination of flavors. You’re welcome! Thanks for the review. Made these for a work luncheon and they were a huge hit! I used raw red bell pepper and sun dried tomatoes, because that’s what I had. Turned out great! A great luncheon option! Thank you for your review. Make these! They are always in my fridge. I eat them every day at lunch. So delicious and super easy to make! So so good! I made this recipe along with another of Kate’s cold salad recipes this week. I also made pita to go with it, but it’s a great stand alone recipe. Hi Kate! I love your blog! This recipe sounds wonderful! Do you have any non-alcoholic substitutes for the red wine vinegar? Thanks! You could try balsamic vinegar. I haven’t tried it, but it does typically work as a substitute. This was delicious! Perfect balance of acid, salty, sweet. I made this as written but divided the mix into 4 meal-size servings and put in mason jars topped with arugula for quick weekday lunches. Perfection. My boyfriend agreed! Thanks for sharing! That sounds like a great way to pack for lunch, Sara. Love that! You’re welcome, Kim. I love many of your recipes but I have a general question. We are limiting both sugar and salt in our diet due to health reasons. We’re so used to it, that it’s not a problem. What I wonder is if the honey or maple syrup is ever required for a recipe to work. We’ve left them out or sometimes used a tad of stevia. Same with salt. I imagine there are chemical reasons for salt in baking, but in cooking, I usually don’t add it, and we’re fine with that. Just thought you might have some thoughts. I definitely appreciate your gluten free alternatives. I’ve sometimes added stevia to dressings, as my husband is diabetic, and they tasted fine to me. I’ve also experimented with some of the ‘no salt’ salts, but to me they didn’t work as well as the real thing. Now I’m eating more whole foods & less processed (thanks to Kate’s recipes!) I figure I don’t need to worry quite so much about using small amounts of sweeteners/salt. Looks yummy, I’m always looking for new chickpea recipes! Let me know what you think when you try it! Hello! I mixed the sauce in a big bowl first and then added the other ingredients so I only had to use one bowl. Laziness! Thanks, Chelsea for the review! I made this last week and it was delicious. I served it with arugula, and it kept well to add to salad the next day for lunch! Wonderful, Sammy! Thank you for your review. Would there be a good substitute for the red wine vinegar? Balsamic vinegar or apple cider vinegar should work well! This salad was excellent. I’m serving it tomorrow but just made it and put in the fridge. Naturally, had to taste test. I used basil infused OO as I had no fresh basil and replaced the red pepper flakes with Shiracha Sauce due to preference. I can see a mound of tuna fish on top, adding some salad greens and/or pasta. My guest tomorrow will be most impressed. Well, of course you had to sample it. That’s the job of the cook. Thanks for sharing and for your review, Penny. White wine will work, too. This was simple and delicious. My toddler doesn’t like chick peas so I blended the salad into a cold soup and he gobbled it up! I also forgot to order the feta and it tasted great with the olives instead. What to improvise! I’m glad you were able to get your toddler to gobble it up. I am a huge fan of you, your website and recipes. I trust you, and know that if I want to make something good, I can turn to you!!! Can’t go wrong! Which is why I know I did something wrong with this recipe. I was looking forward to trying it, was imagining the taste and drooling thinking about it. Unfortunately it turned out to be extremely vinegary. The vinegar overpowered everything and couldn’t taste the basil or peppers. I know that I didn’t put more vinegar; in fact I put less. It makes me think that maybe my red vinegar was bad quality or off? I really can’t think of any other reason! You and everyone loves this recipe,and I trust you and your fans :). So basically, I wanted to get your advice on this : I used a generic brand of red vinegar. Am I supposed to use a better quality one? Have you ever found a difference in different brands/ qualities? Thank you in advance for your time and help, keep up the awesome work! Hi Georgia! You’re so welcome. I’m glad you like the blog so much! The vinegar quality can matter. If you followed everything, my guess is that. I prefer the Napa Valley brand. For vinegars, there are a lot of great options. Thank you so much for your reply Kate!! I made it again with a good quality red vinegar ( by good, I don’t mean a super expensive one, just not a generic brand one), and it was perfect!!!! All the flavoura of the roasted peppers, basil, dressing were there and beautifully blended!!! So another 5 star review from me!! Try it ppl, just pick a better qualit vinegar!!! Just made this. I’ll be lucky if it lasts until lunch time – it’s so good, I keep sneaking a spoonful! I’ve making a lot of health changes the past year or, so and am always looking for healthy ways to dress up sides. I made this recipe last week and it was amazing! I had stop my husband from eating all of it at once. Thank you, Kate. Keep the great healthy recipes coming!! Thank you, Monica! I appreciate the review! So good! Very quick and easy to make. I made Jessica’s Marinated Chickpea Salad for New Years Day and my guests gobbled it up! I made it a couple days ahead and the flavor kept building. Truly delicious and a good healthy way to start the New Year. I’ll be making it throughout the year. Thanks for sharing! This was one of the most delish salads I have had in a long time. I could eat it every day and probably will for some time! I’m happy you hear you loved it, Sophie! Thanks for commenting. Made these tonight and they are outstanding!!! I added cucumber because I had so much dressing in it the bowl, and subbed a can of northern beans for one of the cans of chickpeas (like you suggested). I served it over a bed of mixed greens and fresh chopped veggies – the perfect meal. It tasted like a five star restaurant salad. Thank you! Hooray! You’re welcome, Suzanne. Great way to serve this dish. When planning our vacation I was looking for recipe that was cool, tasty, and was made with chickpeas. I found it on your website. Now that we are here on at a busy ocean side place and have already been to the store a few times I realizard unfortunately I forgot the feta. Has anyone tried a different cheese. I have a white cheddar and goats cheese. Goat cheese usually works well as a substitute for feta. Let me know what you think, Debra! Can one use fresh roasted peppers? I roast them on my burner on a gas stove, turning them until almost completely blacked, put them in a plastic bag and seal until cooled, remove as much black skin as possible, devein and de seed, then chop into desired dice. Wow it’s delicious. I could have eaten the whole bowl myself! I love that! Thanks for the review, Donna. The base recipe is great, but I had to added 1/2 tsp chipotle pepper powder, red onion, 3 tbls lime juice, artichoke hearts and sliced black olives, and it was over the top good. Wish I had Kalamata olives instead of black. I will add the sliced pepperoncini peppers tonight. Thank you for this one. Thank you for sharing your variation, Jim! This is by far the best chickpea salad I ever had!!!!!! Love to hear that! Thanks for the review, Krissy! This looks so good! I would add sundried tomatoes. I love sundried tomatoes. LOL. Do you have the macros for this recipe? How big is a serving? Cant wait to try this. Hi Shelly! The nutritional information is below the notes of the recipe. I hope you love it!